A few months ago, in October of last year I spent quite a while with a mustard yellow Vaporesso Tarot Pro, a 160W Temperature Controlled box mod that, although boxy in the extreme, was just a beautiful piece of craftsmanship. It remains one of best looking, super high quality box mods I own, and the Tarot Nano is every bit the same thing, though much smaller. 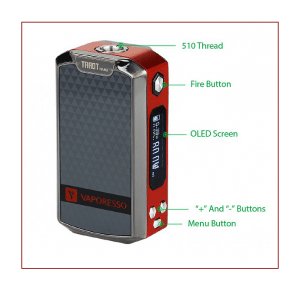 Vaporesso Tarot Nano 80W TC Starter Kit is an ultra-compact box mod that runs on the proprietary Vaporesso OMNI board. 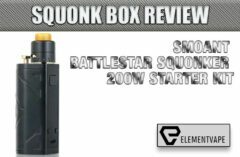 Its power is driven by a 2500mAh battery providing 80W of maximum wattage output. 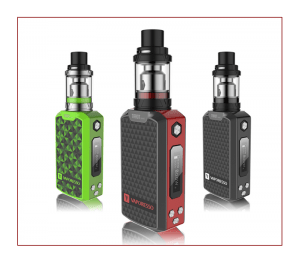 The Starter Kit includes the top-filled Veco Sub-Ohm Tank with the EUC Coil Technology seen in all the new Vaporesso tanks, including the Estoc tank found in the Vaporesso Attitude reviewed last month. The Tarot Nano measures 2.72 inches high, 1.5 inches wide, and .88 inches deep. We’re talking tiny here, but not so tiny as to be unusable. 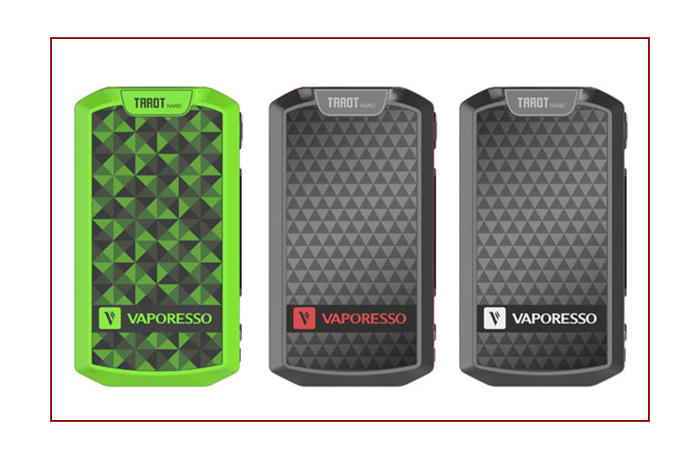 While maintaining the larger Tarot Pro “look”, this tiny mod is balanced between true functionality, ultra-modern yet ergonomic design, moderately long battery life, and ease of use. 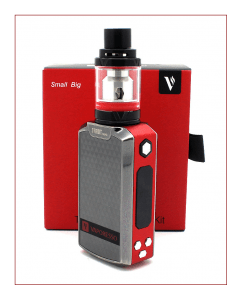 There can be many pitfalls when essentially miniaturizing a successful larger box mod, though Vaporesso seems to have achieved their desired results. For many the 2500-mAh built-in battery is a deal-killer. I can certainly understand that sentiment because I too want to be able to switch out a drained battery for freshly charged one instead of having to plug the mod into my computer’s USB drive and stay tethered to it while it recharges. But, there is an exception to every rule, and sometimes a built-in battery makes sense…especially when the mod is shorter in height than the battery itself. While not exactly the case here, a standard 18650 battery is 2.55 inches in height, whereas the Tarot Nano is 2.72 inches. Going beyond the 0.2 inches in height, Vaporesso has stuffed the tiny Tarot Nano with so much technology that the only way to achieve the desired performance was to fit the device with an internal built-in power source. 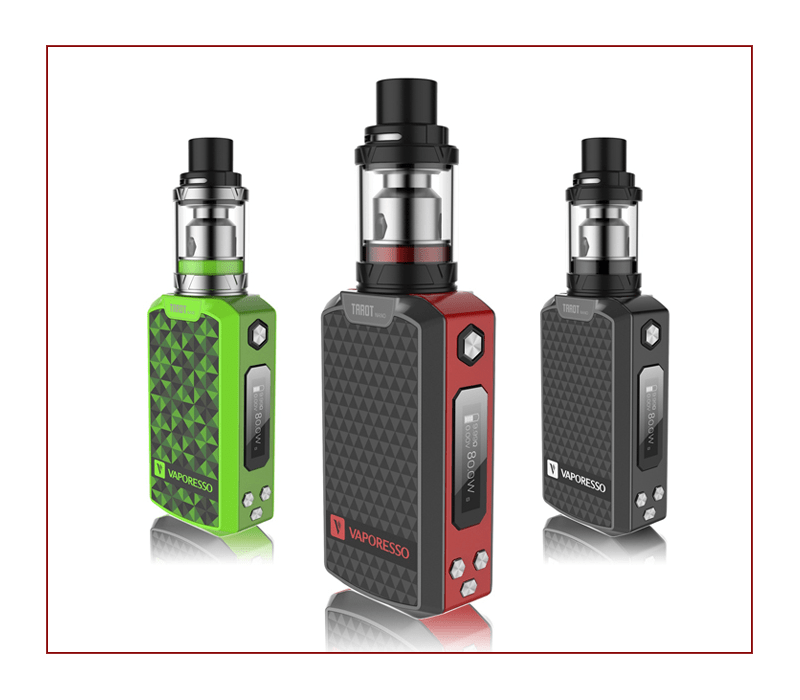 Popping on a Sub-Ohm tank that would require 80W or more for an optimal vape will certainly chew through the battery life quickly, which is why Vaporesso includes the new Veco Tank and coil heads rated as low as 25W and as high as 50W. The Veco Tank is 22mm in diameter and constructed with high quality stainless steel and glass. The EUC coils are “drop in” coil heads, making it easy and less messy by allowing the user to swap coil heads while the leak-proof tank is full of ejuice. Instead of changing out the entire coil, the EUC Coil only requires changing out the core instead of the entire metal sleeve. If it sounds complicated rest assured it not, it’s just unfamiliar. This tank is a top-fill tank with airflow at the top of tank as well. While limited to just 2mL of eliquid, the power required to produce good flavor and good vapor production is low enough as to not burn through the juice as quickly as, say, the SMOK TFV8 Baby Beast, another 2mL tank that must be refilled every 20 minutes or so. There are 3 coil heads available for the Veco tank. Inside the Starter Kit are the 0.4Ω Kanthal Clapton and the 0.5Ω SS316L coils. The ceramic coil option is available as well, and had it been my decision I would have included the ceramic coil over the SS316L. My experience with the EUC coils extends through my use of the Vaporesso Attitude and its Estoc tank and the Veco tank here. I have used all three coil heads and have found each of them to be unique. The Kanthal EUC Clapton is my favorite coil. Rated for 40W-50W, with a resistance of 0.4Ω, this coil provides excellent flavor and vapor. I vape at the higher end of wattage range. The 0.5Ω Ceramic Coil is the next coil in my preferences because of the flavor fidelity of ceramic coils and the durability. It’s harder to scorch a ceramic/cotton coil than it is the SS316L. Lastly, the EUC 0.5Ω SS316L Clapton, rated at 35-40W, may find favor with many vapers, but it leaves me cold. The vapor production is fine, but the flavor fidelity from any SS coil is just not a deep and rich as Kanthal or Ceramic. I tend to think of digital and analog music when comparing Kanthal/Ceramic and SS heating elements. SS coils are sterile, like a digital recording of Pink Floyd’s Dark Side of the Moon, whereas the Kanthal and ceramic coils are like playing the vinyl recording on an expensive turntable. With stainless steel, there is no lusciousness to flavor, no aromatic vapor. I do like the Veco tank as the partner to the Tarot Nano. I’m sure that there are other 22mm tanks that would perform well on the Tarot Nano, but I would recommend the Starter Kit over buying the Tarot Nano on its own, unless the buyer already owns a fine collection of 22mm sub-ohm tanks. There is much more to talk about than the 2500-mAh battery and Veco tank. The Vaporesso Tarot Nano, although tiny, is full of Vaporesso’s latest tech, including a gorgeous OLED display measuring 0.91 inches. 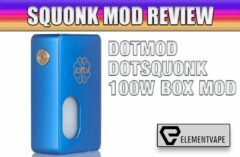 All the information you need is right there, and it’s one of the sharpest and brightest I’ve seen on a Nano-sized box mod. CCW, or Customized Curve of Wattage, CCW, or Customized Curve of Temperature, Bypass Mode, Smart Variable Wattage Mode, and manual TCR Adjustments, and of course VW, or Variable Wattage. I like the Vaporesso Tarot Nano almost as much as I like the Tarot Pro. However, the colors the Tarot Nano are available in does not include the same deep, delicious Yellow that my Tarot Pro is. Instead, the colors that are available include Red, Green, Silver, and Metallic Grey. 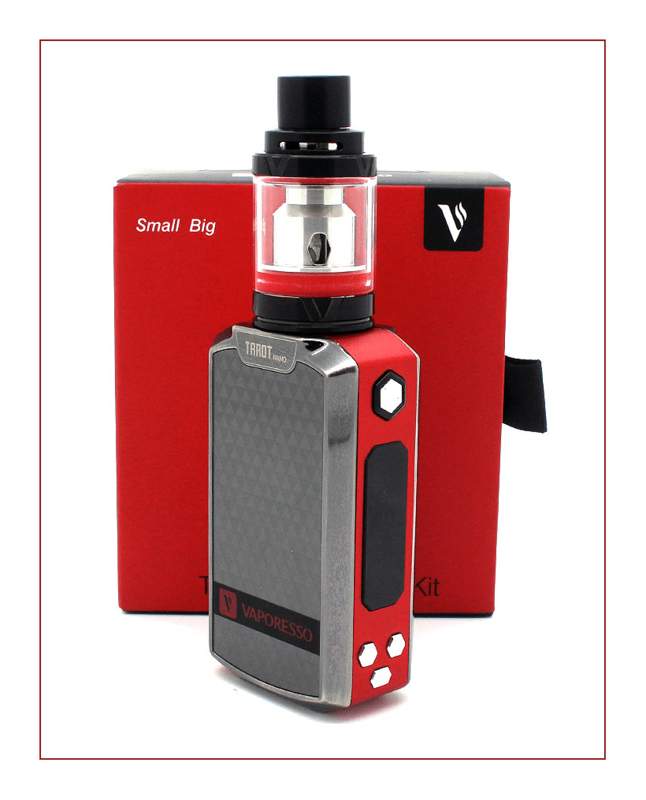 I chose to review the Red one, and was delightfully surprised that the Veco Tank was also Red. There are a lot of Mini and Nano devices on the market today, some will last a few weeks, some will last more than a year, the Tarot Nano is one of the latter. I’m quite sure that the built-in battery will give out long before the luster of the Tarot Nano begins to dim.